The 17th Annual Honolulu Festival hosted a special collaborative event with various indigenous groups on Saturday, March 12. 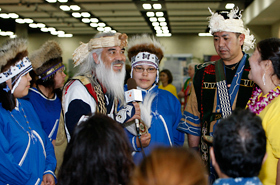 Those groups included the Alaska Native Heritage Center Dancers from Alaska, Descendance from Australia and Hokkaido Ainu Culture from Japan. 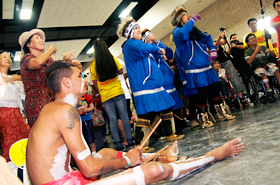 They shared their traditional dance, music and culture. We also welcomed Linda Fujikawa as a facilitator of this event, who is an instructor of Japanese language at Kapiolani Community College. Each group started off by introducing themselves using their native language. The language is one of the crucial elements in shaping one’s cultural identity which must be preserved. If it was forgotten, then one’s identity may be diluted. 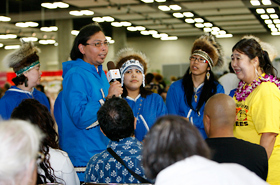 It is important to recognize the value of language used in each culture. 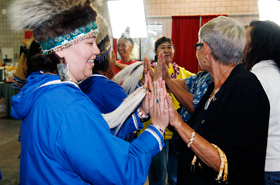 The Alaska Native Heritage Center Dancers greeted in native language, which was unheard of by most people. 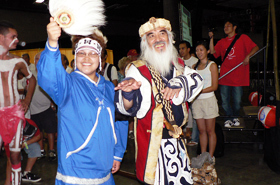 Hokkaido Ainu Culture had joined the Honolulu Festival to spread the word of Ainu culture as many people as possible. 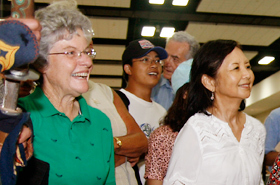 After the greetings, Linda Fujikawa asked everybody to put their hands against each other. Then she told to stand apart, which meant to support themselves by leaning to each other with the palm of their hands. The purpose of this activity was to recognize the importance of mutual understanding and care as a human being. Both strangers put their hands against each other to support themselves. The hands between Alaskan and Ainu were united! 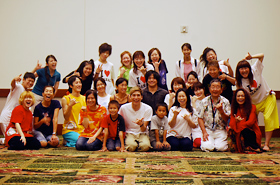 After the activity, each group introduced their culture through various performances. The members of the Alaska Native Heritage Center Dancers performed a traditional Yup’ik dance, accompanied by the rhythm of the Alaskan drums. Each dancer was holding a drum and a feathered fan. Next was the Ainu prayer performed by Hokkaido Ainu Culture which the form of prayer is different by gender. The audience also participated by learning and praying. Lastly, the members of Descendance performed their Aboriginal dance that told a story of the spirits of the ancestors, which descend onto earth and bestowed happiness then return to afterlife. Each culture has preserved and passed onto generation in various parts of the world. 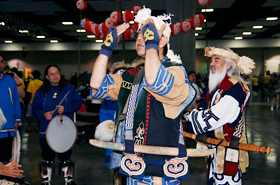 The Yup’ik dance depicted the nature-rich land and the sky of Alaska and Ainu prayer made us feel spiritual. 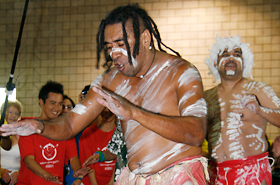 Also, the Australian Aboriginal dance depicted the red-soiled wilderness of Australia and the strength of life. The commonality of these 3 cultures is that the indigenous people worship the nature in which they coexist. 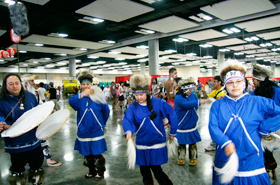 The Yup’ik dance is a tradition of the Yupik who mainly live in the south-western part of Alaska. Ainu prayer looked as if it was speaking to heaven. 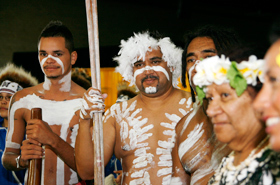 The members of Descendance create a unique melody just by using their voices and playing traditional instruments of the Aboriginal Australians. Our climax was the peace dance, where people of various cultures got together and danced as one. 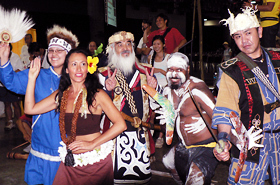 The members of Descendance created a rhythm by beating the boomerangs, accompanied by their traditional instrument called the didgeridoo and sang a song. Everybody was led by the music and started to dance. Gradually, the scene became crowded which the people who stayed outside the circle couldn’t see what was going on in the center. Furthermore, the members of Descendance danced like the emu which the Alaska Native Heritage Center Dancers followed the moves. Also, there was a scene where the Alaskan dance was accompanied by Descendance. They were marvelously harmonious which showed a fusion between 2 cultures. The people who were dancing and clapping their hands looked very entertained with their beaming smiles. The peace dance lasted for nearly 20 minutes which everybody danced endlessly with unity. The audience enjoyed watching the dance of excited performers. 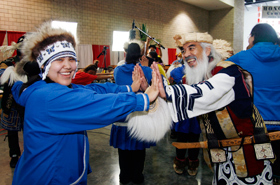 Alaskan, Ainu and Aboriginal Australians all held hands to do the peace dance. 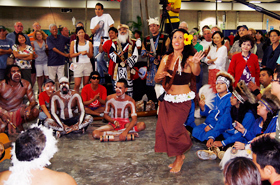 The Alaskan dance was accompanied by the rhythm of the Aboriginal Australians. Toko Shusei, who is the Ainu of Hokkaido explained that one of his duties was to address the problems that various indigenous groups are facing in the world today. However, he also explained that it will be better for world peace if people around the world share various problems instead of strictly focusing on the issues of the indigenous groups. Moreover, Linda Fujikawa explained that we are all the same human beings and the suffix of ‘ing’ in the word “being” indicates that we are in a present progressive form. She added that we should support each other and pass the tradition to the next generation. Afterwards, the cheerful peace dance ended successfully. The members of Sugaizanairen from Kochi Prefecture hosted a program called the Sugaren & International Rainbow Children Project ~Transcendance~ on Friday, March 11, at 1:00 p.m. It was first launched to create a peaceful world for children to nurture their talents. On this day, the members of Sugaizanairen taught their yosakoi dance to the locals. 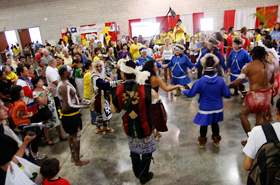 The dance has an ability to transcend the border between countries and unites us regardless of one’s language or age. A small peace can be achieved if everybody danced in unity with beaming smiles. The children seemed to enjoy dancing even though it looked little difficult. This photo was taken after their dancing practice.